Selecting the first African American to become a standard barrier is not always easy which is why Jackie Robinson is so significant a figure today as he was when he integrated Major League Baseball in 1947. 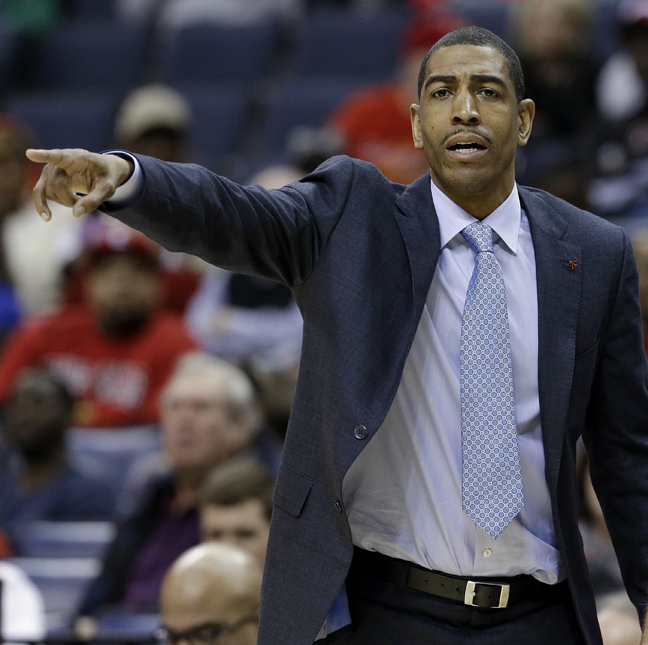 The University of Connecticut basketball head coach Kevin Ollie is not the Jackie Robinson of the coaching fraternity, but when he leads the No. 7 seed Huskies against No. 3 Iowa State in the round of Sweet 16 on Friday in New York he will be carrying the weight of the Crenshaw High School basketball community. Ollie replaced the legendary Hall of fame coach Him Calhoun responsibility on Sept. 13, 2012, when he was named the 18th head coach in the history of UConn men’s basketball. However, his long and arduous trek to the pinnacle of one of college basketball’s most prestigious coaching jobs began nearly 25 years ago while he was playing for legendary Crenshaw High coach Willie West. During the early 1990s, Ollie was the starting guard on two of Crenshaw’s City title winning teams, but he was not among the most talent players to wear a Cougars uniform. “He wasn’t as talented, but was smart and hard working and learned the system. He has the right temperament and we all want him to be successful,” added Williams, who starred at LSU before playing nearly a decade in the NBA. Ollie graduated from Crenshaw and was among the first Southern California players to go east. He spent 13 seasons in the NBA and never averaged more than 8 points in single seasons earning a reputation throughout the league as an outstanding teammate, with strong moral fiber, impeccable character, and a vast knowledge of the game. Subsequently perseverance finally paid off with a multi-year contract from the Philadelphia 76ers. Then went to Cleveland to mentor a young LeBron James about acting as a professional and Oklahoma City brought Ollie in to do the same for Kevin Durant. During a 13-year NBA career, Ollie played for 11 different franchises in 12 cities and learned from 15 different NBA coaches. Ollie was once cut from a team on Christmas day. “What a Christmas present,” he remembered. However with all that experience and the high recommendation of Calhoun to become the next Huskie coach, the school hired him on an interim basis, essentially a seven-month audition. He led a team that was banned from the NCAA tournament to a 20-10 record and was rewarded with a multi-year contract. In just his second season he has UConn playing in the round of Sixteen, compiling a 28-8 record and two victories away from the Final Four. Ollie’s mother, Dorothy, became an ordained minister in the Hays Tabernacle Christian Methodist Episcopal Church in 1989, and Kevin attended services with her from the time he was a child. She never shied from community involvement, never stopped trying to make a difference. He was born Dallas on Dec. 27, 1972, and raised in Los Angeles. Now, Ollie resides in Glastonbury, Ct. a town that boasts a small private lake named Diamond Lake, which is surrounded by growing subdivisions of large homes. A far distant from Crenshaw High. He’s married to Stephanie, also an UConn grad (1997), and the couple are proud parents of two children, son Jalen and daughter Cheyanne. Somewhere, Willie West is smiling, his former teammates are rooting and a bevy of Crenshaw Alumni are cheering for one of their own. The Good Son, the humble soldier, The Cougar, who has done them all proud.